Could you maybe add support to the Peasant and Foresters' mod? Or maybe add more adventure crafting to follow suit. I have a modified (personal) version of it that I'd be willing to link you to. I basically made all of your mod's metalworking fit into P&F's metalworking (mostly for balancing purposes, since P&F's requires more stuff, such as tools). I already had an edited version of Wanderer in for crafting, but sure, I could add an alternate version with support for Peasant and Forresters, just send me the edited version. Do ravager wasps have primary ganglia in their left third legs/left third feet? I've noticed this kind of stuff happen before (wrong message showing up on death - i.e "struck down" despite no instantly-lethal damage happening) - I'm not sure what causes it, and I doubt its a problem with the ravager raws (the wasps use a few custom body parts but their main body is the vanilla insect body plan). My best guess would be the thing bleeding out at the same time as you hit it, which made it count as a "struck down" death. except it would specifically say if it bled to death, wouldn't it? That's why I'm saying it seems to be a bug caused by the creature dying at the very same tic that its being hit at. I've had this happen before - there's no message at the end as to the extent of damage caused, but the thing dies anyway. I fully admit this is just speculation and I could be wrong, but I don't think this is mod related. Re: [44.11] ZM5's Mod Depository - Now with Peasant and Forester's! 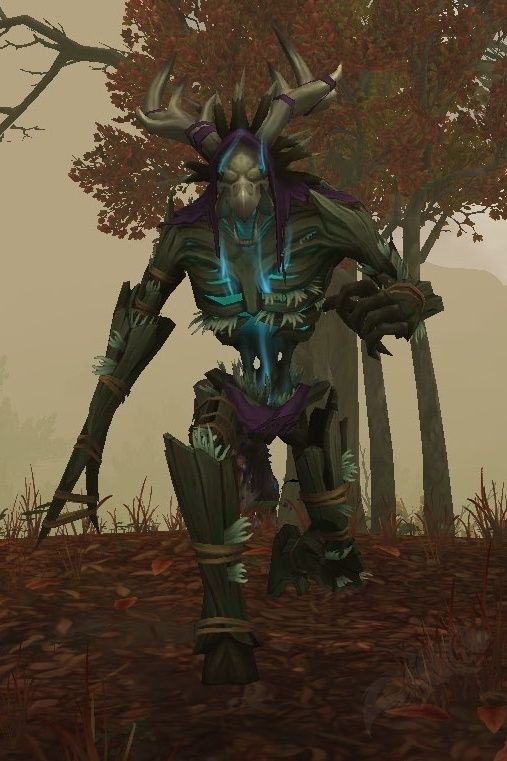 Small update - version of the full packs is now 44.11 - I've also fixed some bugs, like redundant descriptions for legion demons and incorrect names for some of the Dalaranian nobles, also changed some of the tissues for Bog Beasts and Mandragoras so they're more fittingly plant-like. More importantly, I changed the internal names for the vast majority of ammo, armor, tool and weapon types, so as to prevent duplication issues with mods that add similar weapons, like cutlasses, sabres or tridents. The addon packs have been updated accordingly as well. Lastly, I'm adding a new download to the opening post - it's 64-bit DF bundled with peasant cretin's Peasant and Forester's mod, as requested. Hope you guys enjoy it! Glad to know peasant cretin was cool with it! Downloading the new version now! Will the Peasant and Foresters combo work with your mod only 44.10, no add-ons save? You'd probably have to edit the reactions, since they have the altered internal names for the weapons and everything. Re: [44.11-12] ZM5's Mod Depository - Now with Peasant and Forester's! Sorry for not updating this pack in quite a while - I've not abandoned it. The next update for it may take a while longer since I'm planning on doing some untangling of the raws alongside new content - unfortunately I didn't think of doing so before releasing the pack (I initially started modding only for myself, without planning to release anything I've made, so keeping stuff untangled wasn't a priority for me), so its quite a mess right now - once that's done though things should be a lot more modular and easier to keep track of, both for anyone who uses this and for myself. Hey just wanted to pop in and say I like this modpack a lot. It's great. I appreciate your hard work! Thanks! Hope you enjoy the new update once I'm done with it, it's mostly gonna have BFA content. 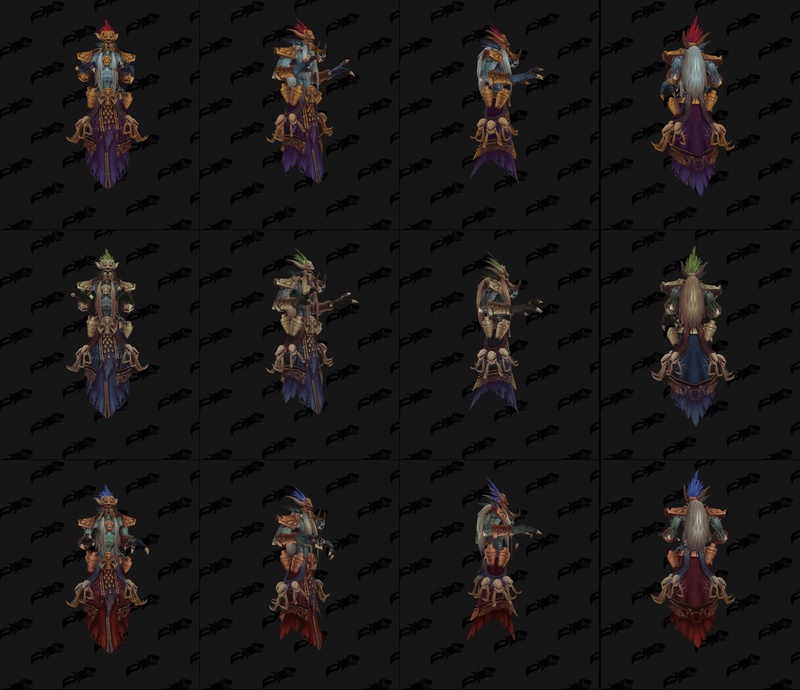 Re: [44.12] ZM5's Mod Depository - Battle for Azeroth update! Major update - as mentioned before, it's Battle for Azeroth content. I highly recommend deleting the previous installations of this (as well as the addon packs) as I've done a lot of reorganizing to make things easier to keep track of, along with some general changes to existing creatures - if you were to just throw the install of this onto the older version it'd cause duplication bugs. 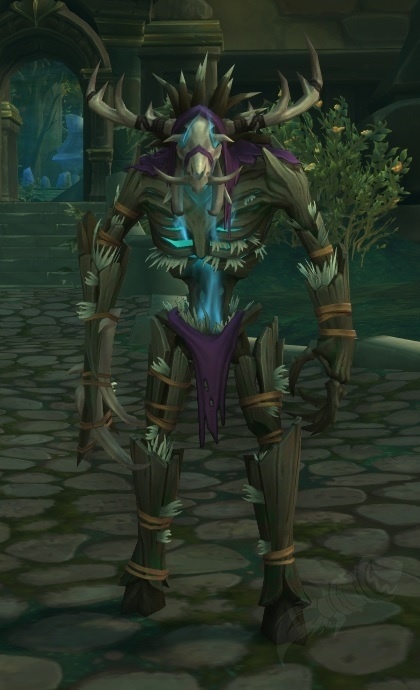 The different treant types (standard, corrupted and nightmare) are now capable of speech and are playable - Gilgoblins are also playable. Nearly all of the wild creatures (where it was conceivable, anyway) have sounds that they make (or actions that become "ambience" when the creature is not in the player's line of sight) - its mostly an adventure mode only thing. I've altered the wood templates so they should be a tad stronger and also not throw out the "tearing the wood/bark" message. I've also split up some of the files to make certain bits easier to remove if the player should choose to do so. Most of the bird creatures have had their "beak jab" attack replaced with a peck attack - should be a tad stronger. I removed the generic "acid" template - the creatures that used it now have locally defined "caustic bile" - it functions similarly, however it now only has local immunities - so, lets say, a saurok can spit acid at a chimaerok and affect it now, whereas previously it wasnt possible. 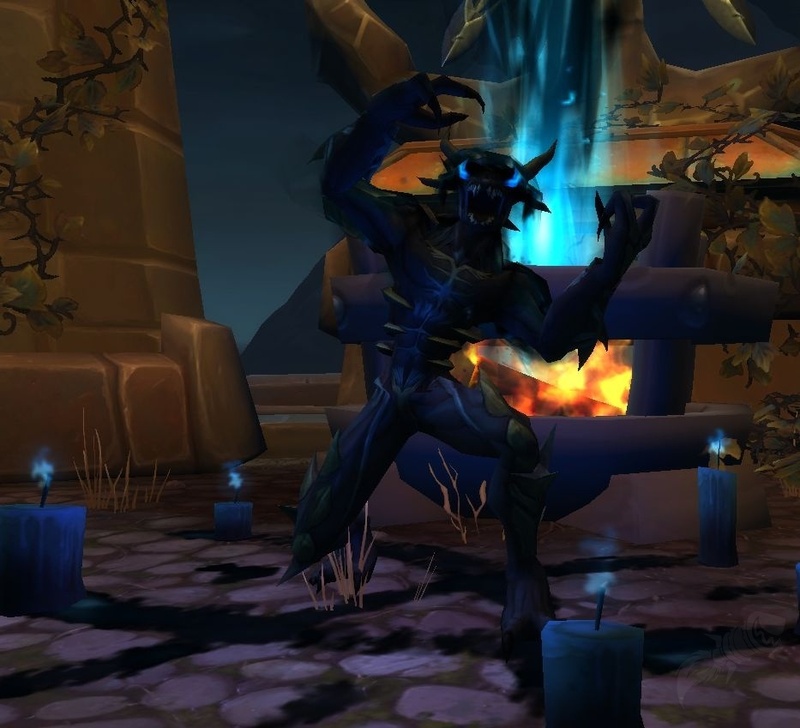 I removed innate skills from the C'thraxxi and the Starspawns - C'thraxxi also no longer have a ground pound interaction. They also have smaller sizes now - however, the C'thraxxi's body plan is more accurate now - they have a pair of antennae, as well as a pair of barbed tentacles at their sides that they can use for attacks. I removed the blight gas reaction from the Forsaken, as well as blight gas itself - for now its kind of pointless, admittedly. Maybe once the magic update hits I'll be able to do something more with it. 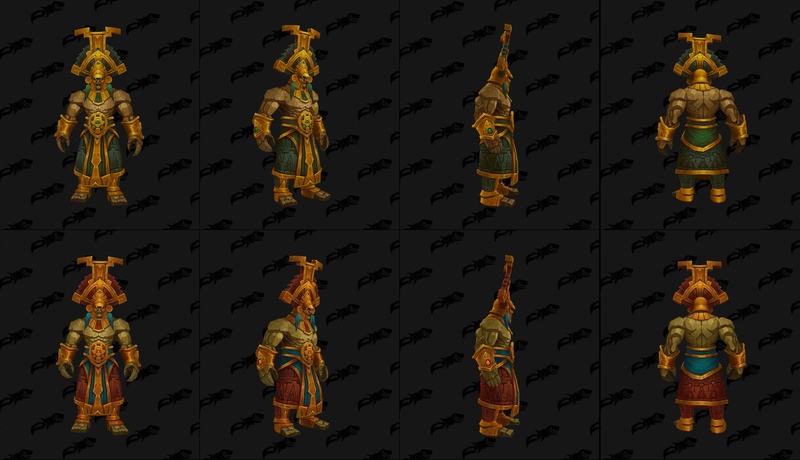 I also added new castes to the Faceless Ones and the Forsaken - the new Faceless castes, aside from the C'thraxxi Juggernauts, are all taken from Hearthstone artwork - the Juggernaut, meanwhile, is from the new C'thrax model introduced in BFA. Lastly, I updated the full packs to 44.12. As for the new creatures, aside from adding BFA content, which includes several new races, wild creatures, wild playable races, as well as three new megas, I've also included four of my own races that are meant to go along with the setting of my cavern revamp and my good/evil biome revamp. Tortollans - a race of turtle-like humanoids. They live in towns in the wetlands, deserts and forests. They are more easily capable of swimming, are amphibious, and innately have more toughness. They are primarily a neutral race, and are unlikely to be at war with the player. Vulpera - a nomadic race of fox-like humanoids. They live in towns in the savannas and deserts. As they are a mercantile race, they will most likely not be hostile by default, short of wars in worldgen. Aqir - an insectoid race, the ancestors of the Nerubians, the Mantid and the Qiraji. They live in fortresses in the savannas, grasslands and shrublands. They are quite large in size, and walk on four legs. Their entire bodies save for the head are protected by a tough carapace. They have a pair of scythes at their wrists, making them deadly even when unarmed. The Aqir are one of the few races to use Saronite - they may occasionally use it for weaponry, shields and masks. However, they have no other armor. They send out snatchers, and are hostile by default. Fungarians - small mushroom-like humanoids. They live in forest retreats in the wetlands and tropical forests. They can enter a berserker rage, and can also release undirected spores to cause drowsiness. They use a set of primitive weapons - their only protection comes from shields and masks. All of their weaponry and armor will be made of hardened fungus. They send out thieves and will be hostile, unless one plays as the Ogres. growing from their faces, which hide toothy maws. They live in towns in the taigas, temperate shrublands, grasslands and coniferous forests. All of the K'thir can enter a battle fury, throw water bolts to do ranged damage, and cast frost armor to bolster their toughness. They do not need to eat, drink or sleep, and feel no fear. They use a weapon set similar to that of normal humans - however, for protection they only have masks and shields. They can use occasionally use masks or weapons made of Saronite. They send out snatchers, and will be innately hostile. Witches - human females who wield death magic. They live in towns in temperate wetlands, temperate forests and grasslands. more severe pain and makes the target more vulnerable to attacks. 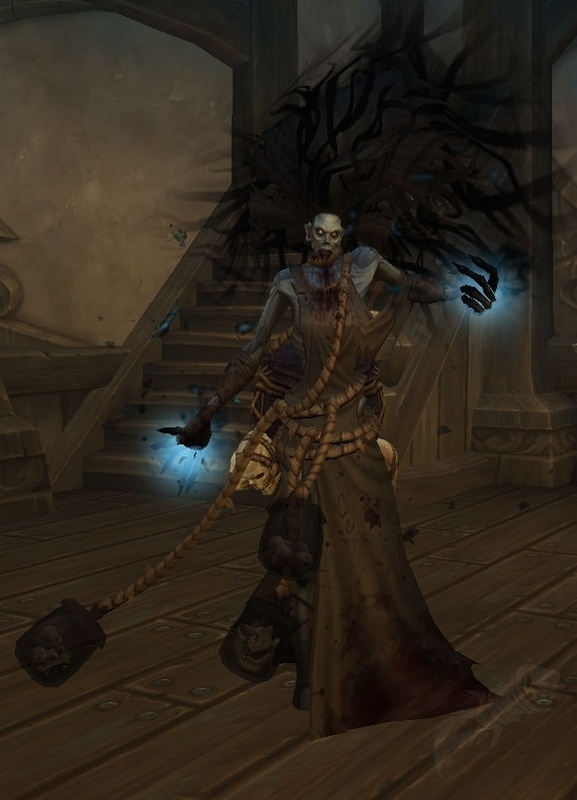 The Deathbound are a male caste, and are the second most common. They are larger than normal humans, and their left leg and left arm are replaced with ones made from wood and bone - they lack a left hand, and instead have a large club, giving them a devastating attack even if unarmed. They feel no fear or pain and cannot be nauseated. They can enter a berserker rage. They count as undead creatures, and learn unarmed combat skills at twice the usual rate, as well as axe, mace and hammer skill at 150% of the usual rate. However their ranged combat skills (save for throwing) are only learned at 5% of the usual rate - most other labor skills are also learned at 25% of the usual rate. The Ascended Hags are a rare female caste, and are the leaders of the witch covens. They float above the ground, so cutting off their legs will not knock them to the ground. Like the Deathbound, they count as undead creatures, do not feel fear or pain, and cannot be nauseated. They are slightly larger than normal Witches, and have different spells. They can throw two shadow bolts at the same time, and can cast Extract Essence on up to 5 corpses, which reanimates them as Soul Essence minions, Dread Mark, which reduces endurance, toughness, and focus to 75% while also making the target more vulnerable to future attacks, as well as Fragment Soul, which reduces toughness to 65%, willpower to 75%, and has a chance of causing drowsiness in the target. On death, they leave no bodies behind, merely dissipating into a cloud of energy. All of the castes do not need to eat, drink or sleep. The Witches have no armor besides masks, and do not use shields either. They have similar weaponry as those of normal humans, and occasionally will use weapons or masks made from Cursed Bone. They send out both thieves and snatchers, and will be innately hostile. Sethrak - snake-like humanoids that worship gods of lightning. They live in towns in the deserts and savannas. They can enter a battle fury, and can spit poison from a distance, causing blisters and pain. Their bites inject a venom that can cause pain and paralysis. They have a varied weapon set - for protection, they only lack leg and foot protection. They send out thieves, and will be hostile, unless one plays as the Ogres. Drust - a race of large, human-like creatures. Slaughtered in ages past, they have made their way back into the world of the living in order to seek revenge. They live in towns in temperate forests and taigas. They have two variants - both feel no fear or pain, and do not need to eat, drink or sleep. Both are the same size, and can enter a battle fury. Regular Drust are the standard caste, and have no special abilities. Drust Deathspeakers are rare, and are magic users. They have two pairs of antlers, and skulls ingrown into their right arms. Their right arms below the elbow are covered in a layer of wood. They can cast Shadow Bolt to do damage from a distance, can reanimate up to 10 corpses at once, and can also cast Curse to lower the combat rolls of their targets. The Drust use a variety of primitive weaponry, and have no armor besides masks and no shields. All of their weaponry will be made of Cursed Bone. They send out both thieves and snatchers and so will be hostile. Blood Trolls - a subrace of Trolls who worship a god of blood. As their deity has no need for technology, they regressed to a far more primitive state compared to other Trolls. They live in forest retreats in the wetlands. They have both normal and dire variants, the latter being less agile but much stronger and also much more rare. All blood troll types feel no fear. As their societies are matriarchal, the male blood trolls cannot hold noble positions - all of their noble positions are filled by the females. 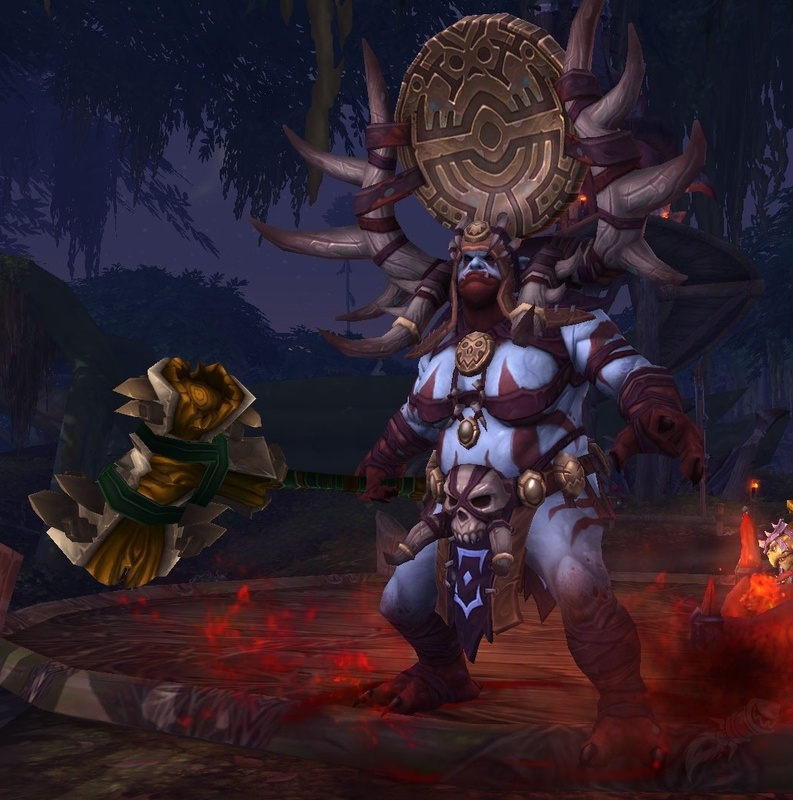 Blood Trolls have a set of primitive weapons, and only have shields and masks for protection. Their weapons and armor will only be made out of either Cursed Bone or Bloodcursed Wood. Skeletal Troll - reanimated trolls found in evil tundras, taigas, mountains, wetlands, forests, savannas, grasslands, shrublands and deserts. They do not feel fear or pain, cannot be overexerted, do not need to breathe, eat, drink or sleep, cannot be made dizzy or feverish. Their attack methods are the same as those of normal trolls. Undead Troll - reanimated trolls found in evil tundras, taigas, mountains, wetlands, forests, savannas, grasslands, shrublands and deserts. do not need eyes to see, feel no fear or pain, and cannot be made feverish. Both the normal and dire variants can enter a berserk rage. Troll Lich - semi-corporeal troll spirits found in evil tundras, taigas, mountains, wetlands, forests, savannas, grasslands, shrublands and deserts. They feel no fear or pain, do not need eyes to see, do not need to breathe, eat, drink or sleep, and cannot be made feverish. As they are only hovering torsos, they cannot kick - they still have all other methods of attack, however. which makes a target take more damage from incoming attacks and lowers their combat rolls. They are weaker to Ghost Iron - on death, they leave no corpses behind, merely dissipating into a cloud of energy. Ancient Watcher - lesser titanic watchers, found in good deserts, tropical forests and wetlands. They feel no fear or pain, cannot be stunned, do not need to breathe, eat, drink or sleep, cannot be made feverish, nauseated or dizzy. They can be tough to damage due to their stone skin. They can throw holy bolts to do blunt damage, and can cast Purifying Beam - on most targets, it merely causes severe pain and mild bleeding. However, on undead, eldritch and demonic creatures, the pain and bleeding are both more severe, and on top of that it reduces their strength to 75% and makes them more vulnerable to future attacks. Gluttonous - a large, pig-like humanoid, formerly a human. Found in evil taigas and temperate forests. They feel no fear or pain, and their stench can be smelled from a long distance away. They also enrage more often. They can enter a berserker rage, and can regurgitate bile at their foes, causing blisters and nausea. They learn butchery, cooking, brewing, fish dissection and small animal dissection at twice the usual rates. Blighted Fiend - gangly, undead humanoids from the realm of the dead. Found in evil taigas and temperate forests. They do not feel fear or pain, do not need to breathe, and do not need eyes to see. Their heads are merely skulls with six horns, and they have bone plates protecting their shoulders, lower arms, hands, fingers, and lower legs. 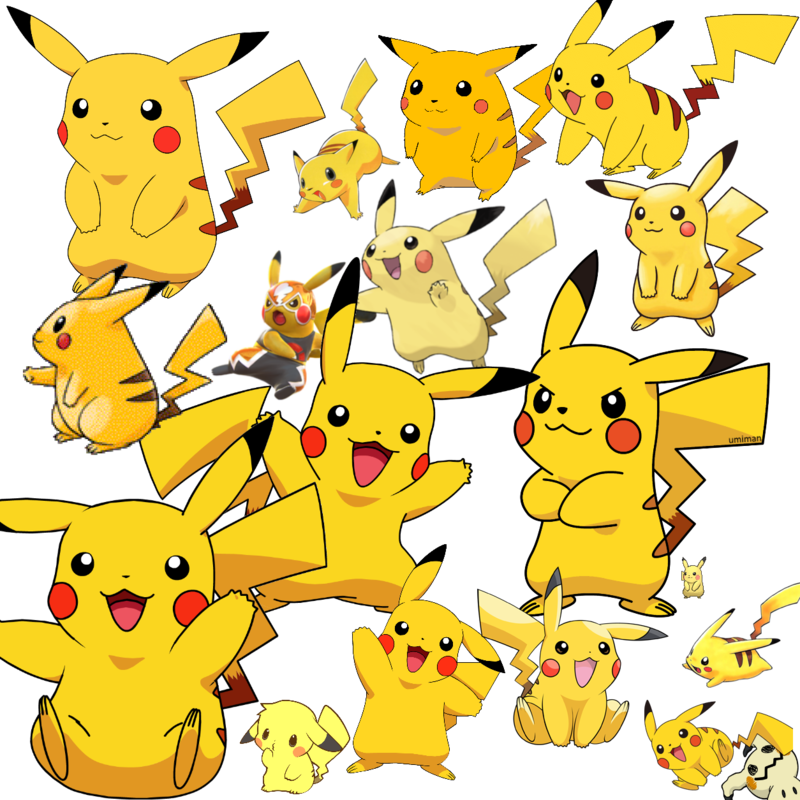 They are innately more agile, do not need empty hands to climb, and their climbing speed is also faster. Their scratching attacks cause more serious bleeding, as well as pain in the injury. They can also enter a berserker rage. Wicker Golem - intelligent undead spirits that inhabit bodies constructed of wood, twigs and bone. They have three variants. All feel no fear or pain, do not need to breathe, eat, drink or sleep, cannot be stunned or paralyzed, and cannot be made nauseaous, dizzy or feverish. 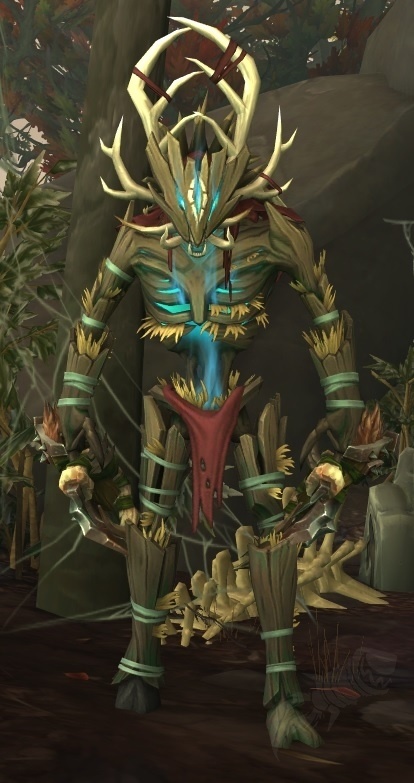 Wicker Golems have two hands, two tusks and four antlers. They can attack by punching, scratching, kicking, biting or goring with their tusks and antlers. severe pain in the wound due to leaving behind jagged splinters. They can also peck with their beaks. Wicker Guardians have one normal hand - the other is a stub which has a pair of hooked, sharp bones attached to it. They can slash with those bones to cause deadly injuries. Their skulls are jawless and so they only headbutt - aside from that, they have two antlers and two tusks that they can gore with. Embalmer Golem - intelligent construct of stone, used by the Zandalari. It has a mask-like head with two tusks, and is covered in wrappings. They feel no fear or pain, do not need to breathe and cannot be stunned. They can shoot globs of embalming fluid which has a chance of reducing speed to 75% and agility to 85%. They can also cast Drain Fluids, which reduces endurance to 75%, and can cause dizziness and bleeding in the target. Gotta split up the post here due to the character limit.